Collingwood produced one of the great preliminary final upsets, demolishing Richmond in the first half and holding on to win by 39 points, ending the Tigers’ 22-game winning streak at the MCG. Led by a stunning performance from American Mason Cox with three goals, the Magpies were too strong for the defending premiers in front of a crowd of 94,959 at headquarters to seal the team’s first grand final spot since 2011 with a 15.7 (97) to 8.10 (58) victory. Collingwood led by 44 points at half-time, and despite a second-half comeback by the Tigers, the Magpies had too much in reserve. Who saw this coming? Not even the most ardent Magpies supporters would have expected their side to come out and smash the reigning premiers in a half of football that all-but sealed a spot in the grand final. The Tigers and the Magpies were playing each other in a final for the first time since the 1980 grand final, where Richmond won by a then-grand final record margin of 81 points. Richmond had beaten Collingwood the last six times the two sides had met in finals — the last time the Magpies ended up on the right side of the ledger at the business end of the season was the semi-final in 1937, when Gordon Coventry booted six goals in a 39-point win. Each of the first two quarters saw the underdog Magpies kick five goals to the Tigers’ one. Only a goal to Jack Higgins in the final 35 seconds of the half kept the margin under 50 points at the main break. Collingwood brought Richmond-like pressure from the very beginning. 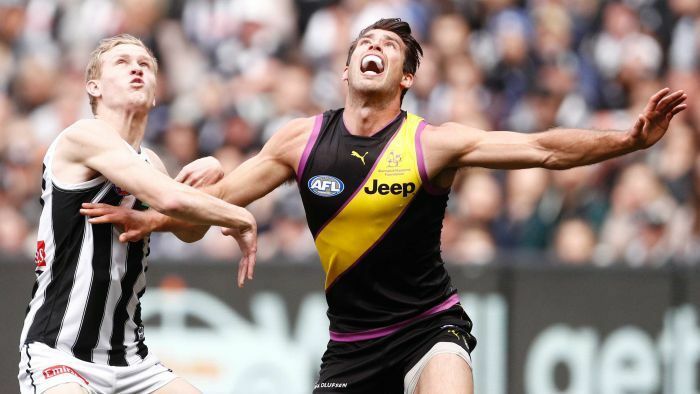 They kept the Richmond attack — which is capable of overwhelming sides — to just 23 inside 50s in the first half, as the Tigers struggled to make headway. Nathan Buckley’s men were fiercer at the ball, better in disposal, and able to keep the Tigers from breaking tackles and regaining the momentum. On the Magpies side, they were led by the two big men. Brodie Grundy dominated in the ruck, while Cox proved an unlikely hero, dominating in the air and booting three vital goals to half-time. As important as his goals, however, were his eight contested marks for the match, which set up Magpie attacks and also stopped attempts by Richmond to surge back in the game. At various points, the Collingwood supporters were chanting “USA! USA!” in honour of the big Texan footballer. Richmond came out hard in the third quarter, but the Tigers found it hard to make things count on the scoreboard. When Brody Mihocek kicked a goal halfway through the quarter the lead was back out to 45 points, but majors to Bachar Houli and Jack Riewoldt — the latter his third of the term — brought the gap back to 33 points at the final change. Tigers fans were beginning to believe, and Riewoldt took a mark inside the first 60 seconds of the final quarter and kicked his fifth, the momentum was all with the defending premiers. The roars from the Black and Gold faithful rang around the MCG when Jack Higgins brought the gap back to 21 points at the seven-minute mark. But Adam Treloar’s steadying snap calmed the nerves before Rising Star award winner Jaidyn Stephenson sent the Collingwood Army into a frenzy with the sealer in time on. Jordan de Goey was again a big influence for Collingwood with four goals, and Steele Sidebottom led the possession count with 41 disposals. Richmond could only rue the lack of help for Riewoldt up forward, while Dustin Martin — who trained lightly during the week while dealing with a bad corked thigh — could only manage 19 disposals and was far from his usual dominant force. The Magpies — like the Tigers before them — have gone from a 13th-place finish to a grand final spot the following year. Collingwood will now face the winner of Saturday’s other preliminary final between West Coast and Melbourne at Perth Stadium.